Are you looking for the best TV tuner card for your PC? A TV tuner card is indeed a very convenient entertainment solution. With it, you will be able to bring cable TV, DVR, and even Internet TV services into your personal computer with just a single device. As for the moment, you are apparently considering to get either Ceton InfiniTV 4 or Ceton InfiniTV 6. Both are popular TV tuner cards on the market that people love because of the performance and quality. However, Ceton InfiniTV 6 is available at a higher price than Ceton InfiniTV 4. So, which is the one that you should get? The fundamental difference between Ceton InfiniTV 4 and Ceton InfiniTV 6 is the number of tuners available on each model. As the names suggest, Ceton InfiniTV 4 only has four tuners whereas Ceton InfiniTV 6 has six tuners. What you need to know is that a single tuner can only perform one specific job at a time, either displaying or recording. So, if you want to watch and record a TV channel at the same time, you need to use two tuners. With Ceton InfiniTV 4, you will be able to watch and record two channels simultaneously, or record four channels at once. With Ceton InfiniTV 6, you can watch and record three channels, or record six channels all at once. Both Ceton InfiniTV 4 and Ceton InfiniTV 6 are compatible with Windows Media Center Extenders, Ceton Echo, and Xbox 360. They can deliver both standard-definition and high-definition TV channels, including premium and encrypted cable channels. Both are compatible with any US TV cable provider, and they also support the SDV technology. Both are very easy to set-up, enabling you to stream live channels or recordings to multiple TVs in the home form a single cable connection and a single card. Of course, with higher specifications, come higher system requirements. Before you go all the way to choose Ceton InfiniTV 4 or Ceton InfiniTV 6, you need to make sure that your personal computer will be able to handle the function. Ceton InfiniTV 4 requires at least a 2.0 GHz dual-core 64-bit processor and 3 GB RAM. Meanwhile, Ceton InfiniTV 6 demands more; you need to have at least a 2.5 GHz dual-core 64-bit processor and 4 GB RAM. In addition, the hard disk drive should have at least 7200 RPM speed. Both models furtherly require an HDMI output or DVI output with separate 5.1-channel audio output, an M-Card, and obviously the TV display. You may also need a tuning adapter from the cable provider if the service uses the SDV technology. Don’t forget that both models do not support NVIDIA nForce motherboards and chipsets; and that Ceton InfiniTV 6 doesn’t support tuner sharing and network bridging. Features - Works with any U.S. cable provider: InfiniTV 4 PCIe connects to any U.S. cable system to receive all SD and HD digital cable channels without needing a separate set-top box. - Brings cable TV services to the PC, enabling cable + DVR + Internet TV and more, all on one device. - Low-profile PCIe card that also works in full-height PC cases. - Eliminates costly set-top box lease fees and monthly DVR fees - Watch & record 6 HD cable TV channels simultaneously, including premium cable channels. - Brings cable TV services to the PC, enabling cable + DVR + Internet TV and more, all on one device. - Eliminates costly cable box lease and DVR fees. 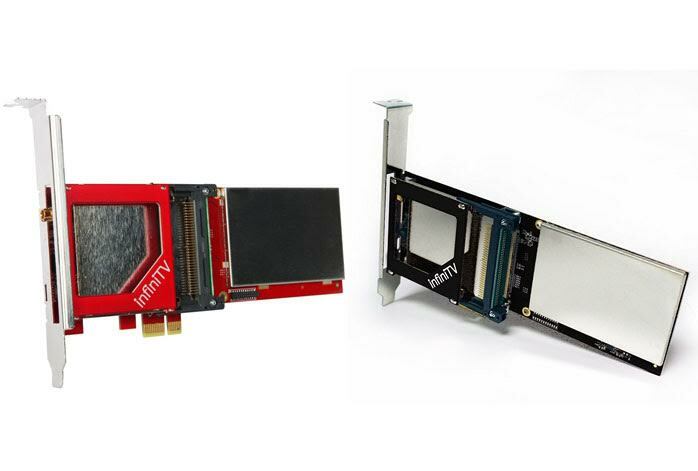 - Low-profile PCIe card that also works in full-height PC cases. So, depending on your needs, you can choose Ceton InfiniTV 6 to be able to watch and record more channels at once. However, if four tuners are sufficient for you, you can choose Ceton InfiniTV 4. Ceton InfiniTV 4 is also the way to go if you need the network bridging feature.